Ok, folks – I haven’t been saying a lot about this because, even though this is my blog, it’s not all about me. But, I need to give you fair warning that there will be a LOT of photos coming up for one particular wedding and the events that surround it. Why? Well, because my very own daughter is getting married. So exciting! And, of course, with a wedding comes stationery and my daughter loved the selection at Minted. You’ll see her choice below along with a bit about our experience ordering Minted wedding invitations. Hill City Bride is a Minted partner, and a purchase made through one of our links goes to help our blog and could quite possibly help pay for a wedding. When it comes to wedding invitations, choosing the right one is important. After all, it is the first impression your guests will have of your wedding. How exciting! My daughter, Aubrey, has always loved lavender, so she knew that she wanted to incorporate both the color and the plant into her big day. She also loves the whispy feel of wildflowers and wanted a square invitation. 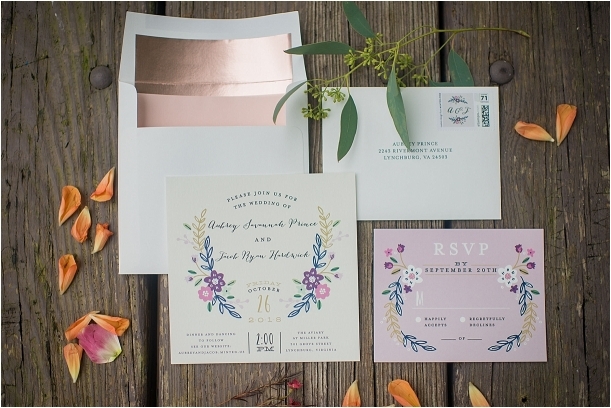 When she saw the “Wildflower Crest” style of Minted wedding invitations, we both immediately fell in love! Aubrey loved the colors in the invitation suite so much we used it as the wedding color palette. So pretty! Curious about our experience? I’d love to share! Take a peek at a few of the things I loved about ordering wedding invitations online. The site was easy to navigate. The ability to search by color, style, shape, and price is so helpful. 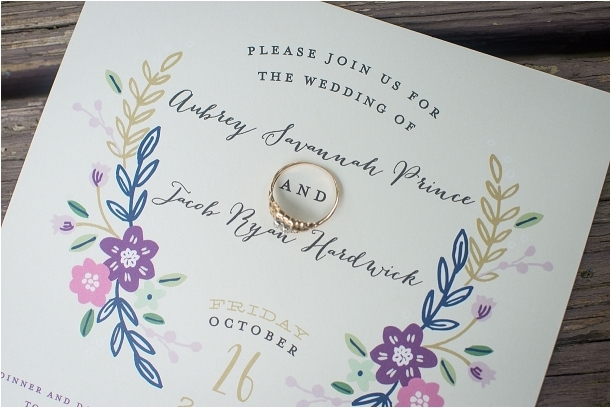 Aubrey’s main criteria included square invitations in purple hues. She also wanted some sort of circle or oval as a focal point, so I can’t tell you how perfect these were. This design also comes in navy and charcoal for those who like a darker background. We already loved the fonts, but adding in middle names made the text a bit wide. The ability to adjust the font size was handy! 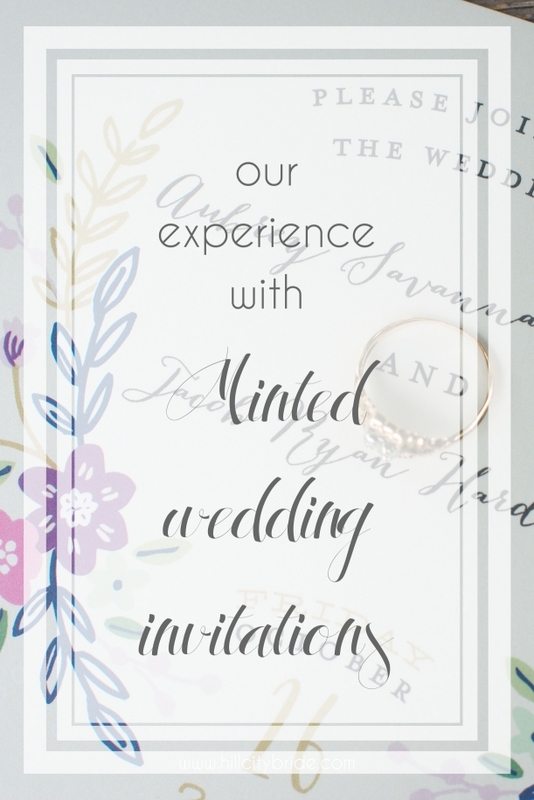 There was so much to love about the invitation itself that we just made minor tweaks, but doing so was simple. There are many matching pieces. For the stationery suite, we ordered the invitations, RSVP cards, and matching stamps for both the invitations and RSVP cards (so cute!!). We are finalizing our ceremony order and menu details, so we will also be ordering the programs, menus, table numbers, favor stickers, and the ever important thank you cards. There are SO many matching pieces, which is both beautiful and important for a cohesive feel. Just look at that suite below. I’m in love! She also got the matching website that coordinated with the invitation. Love that! Checks and balances add confidence. Once you place your order, Minted checks to be sure that everything looks perfect. The person who checked ours over made a few small recommendations to help us come up with an invitation to truly notify our guests in style! As with anything I order, I’m a bit impatient. I check to see where it is in the process – ordered, packed, shipped, out for delivery. Aubrey’s invitations came in a timely fashion, and everything was ready for us to put together easily and send out once it arrived. I love how everything from Minted feels. The paper has such a quality to it, which is also important for longevity and offering a great first impression to the recipient. The highest compliment of all is that our wedding guests loved the invitations. They are hanging on fridges all over the US – even mine! We’ve also given a few to wedding vendors so that they could have a copy of the color palette, and they have raved about them, too. Aubrey’s wedding is 3 weeks from today, and I can’t wait to share more of Minted’s coordinating pieces after the big day. If you would like to see more of this particular suite, just click here. Want to see how else Minted can help besides stationery products? See how they can help with decor here. A special thanks go out to Meridith of MDK Studios for taking these lovely images! Momsfy - These are some really adorable wedding invitations. Also, with so many customisation options available, we can get what we really want. Thanks for letting us know about it. Kari @The He Said She Said Experience - They are lovely, really unique too. Congratulations! Tonya Morris - Your invitations are just beautiful! I just got married last month and thought the invitations were such an important part of our wedding! fashionandstylepolice - I like sites that are easy to navigate. The last thing I need is wasting time trying to figure out what I need to do when placing an order. Kate - Is her name really Prince?? How funny and great at the same time is that! And of course lovely cards. Melissa Bradbury - I bet you are so excited about your daughter’s wedding. I would be the same. Those invitations are gorgeous too! Monidipa Dutta - Your invitations are just beautiful! Next month I’m getting married and I feel how important invitations are. Nina Nichols - Congratulations and best wishes on the wedding of your daughter! I am sure this will be a gorgeous wedding and the photos will be as amazing as the other pictures you took before! Aiai Damigo - Congratulations and best wishes. The invitation really looks great. I like the details and the style! blair villanueva - OMG these invitations are so glamorous like the wedding per se! It gives very good impressions to the guests and for keepsake especially documenting it online. Azlin Bloor - I love these invitations, they are young cheerful and vibrant! had a quick look at Minted’s site, and you are right, the have such wonderful stuff and ideas! Have a fabulous time at your daughter’s wedding, I’m sure it will go swimmingly well! Rosey - Everything you mentioned matters. The most important thing after quality though, is that the site is easy to navigate. If I’m on a site that frustrates me, I don’t care how high the quality is, I’m out. Good to know about Minted! Ali Ash - You’ve really thought out of the box with these invitations. They are beautiful. How thoughtful for parents to offer such lovely invitations to their children who are getting married. Chinedu - Minted wedding invitations sound great! I love how personal and cheerful it looks and the involvement of the workers in the design (in terms of recommendations). Cristina - These are gorgeous invitations. They get everyone so excited for the big day!